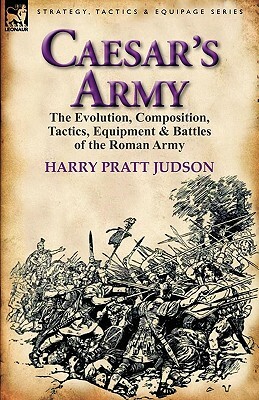 Students of military history have long been fascinated by the history, armies and great commanders of ancient Rome; for within its organisation, strategy, tactics, weapons, campaigns and wars are to be found the origins of each of the military disciplines, demonstrated by often sophisticated methods and practices, developed millennia in the past and yet still able to provide valuable lessons to strategists and tacticians in the modern world. Rome had a long history and in keeping with all empires marched a Hard road to its zenith before commencing an equally long decline. We often look towards the period of Gaius Julius Caesar and his legions to appreciate the Roman military machine in some of its finest hours. This book is an invaluable guide for those interested in the Roman Army during Caesars time. It details army organisation, weapons and equipment. It examines the Legions and the cavalry in detail both on and off the field of battle. Tactics, fortifications and siege engines are fully described, as are methods of fighting afloat. Finally, the enemies of the Roman Empire, from the Gauls to the ancient Britons, are considered and their battle tactics and fortifications examined. In this Leonaur edition the illustrations from the original edition have been enlarged to assist the reader and maps of notable campaigns, battles, sieges and marches are also included.